Sticky Labels Blog | Sticky Labels News | Are you Stuck Up? In a world of digital printers and flashy design software, do you really need to rely on a professional company to supply your stickers and labels? If you don’t care about the quality and consistency of your labels, then the answer is probably no. But if you’re looking for a company that offers years of experience, a simple design process, fabulous final products and competitive pricing, not to mention free and speedy delivery, then you’ve come to the right place. We understand that price is a key consideration when you’re looking to purchase any printed labels. We offer great cost savings across our whole range and are dedicated to using high-quality materials on every label we send out. The more you order, the more you save too. For example, if you order more than 2,000 labels from us, we will offer you a huge 20 percent discount. Furthermore, we offer discounts of up to 32 percent on larger orders and all our prices include VAT, so there are no nasty hidden charges. A printed label really is worth the money spent and at Sticky Labels, you will not need to pay much. At Sticky Labels, we use the highest grade of materials to produce our printed labels. We can also advise on the best materials to use for your specific requirements and are dedicated to ensuring every label looks its very best. One thing we can also guarantee is consistency across every roll of labels. There’s no need to worry about our inks running out or misaligned prints. We get it right every time, on every roll. Firstly, our Full-Colour Labels on Rolls offer a simple, cost-effective set of sticky labels that are digitally printed on fabulous white gloss paper and are supplied on rolls. Secondly, our Single-Colour Printed Labels come in a choice of single print colours and label backgrounds. All these printed labels are supplied on rolls, with many sizes also supplied with a convenient dispenser. Lastly, our Full-Colour Labels on A4 Sheets are digitally printed labels, with some sizes also available on white vinyl or matt clear. For our Single-Colour Printed Labels on Rolls and Full-Colour Labels on Sheets, you will be given a great choice to form the basis of your design. Choose from a range of background finishes and shapes and, voila, your design is nearly complete. 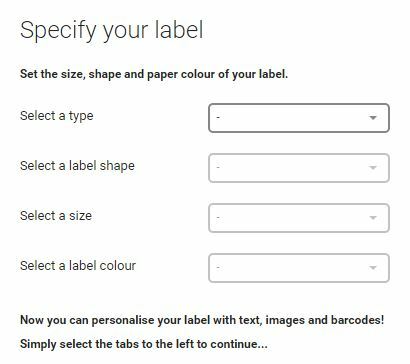 For the last step, simply click to order your labels through our online portal. We’ll dispatch your labels in just three days, or sooner if your order is urgent, and offer free UK mainland delivery to all our customers. We have more than 40 years of experience at Sticky Labels in creating high quality bespoke printed labels and promotional products. No job is too big, too small or too unusual for our team of professionals, who can advise you on designing the perfect set of printed labels. We also offer a no-obligation quote to customers looking to design a more complex set of custom labels or a high volume of printed labels. Just give us a call to find out more on 01205 808 461. This advice does not end when the design process does, or even after delivery. We pride ourselves on offering exceptional customer service; that’s why we’ve lasted so long in the marketplace and continue to go from strength to strength. You Really Can’t put a Price on Experience. 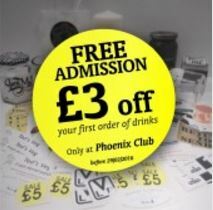 So don’t get stuck up on trying to opt for the perceived cheapest option for your printed labels. 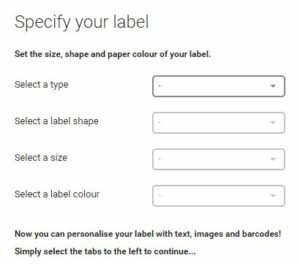 Choose a professional service that’s got a wealth of experience, a simple design process, competitive pricing and speedy delivery to produce a high-quality set of printed labels. If you do, we promise you’ll stick with Sticky Labels for a long time to come.